From the cover of " Underwriters Salvage Corps Cincinnati History ". Salvage Corps Companies 1 & 2 operated identical 1951 GMC-Kinnaird salvage rigs. They are seen here operating at an unidentified location. 1950 GMC Panel Truck The actual date of purchase for this vehicle is ot known. The truck was constructed between 1948 and 1950. 1947 Cadillac-Kelly Auto Body Company. 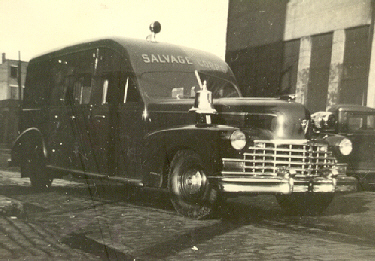 The Salvage Corps rode to fires in style with a radio equipped Cadillac. 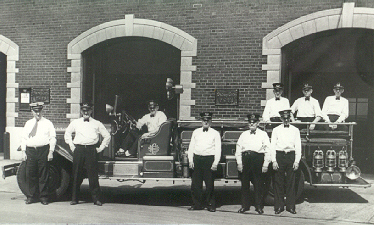 Kelly was a body company located in the West End that turned out several pieces of fire apparatus over the years. 1942 Packard-Henney Salvage Car. Henney actually built these vehicles to be used as ambulances. 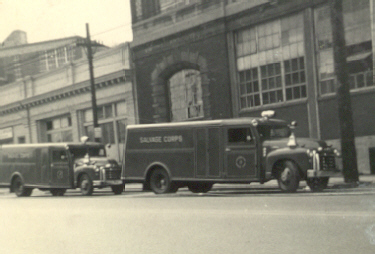 Company 1 of the Corps is seen on Lincoln Park drive in front of Union terminal. 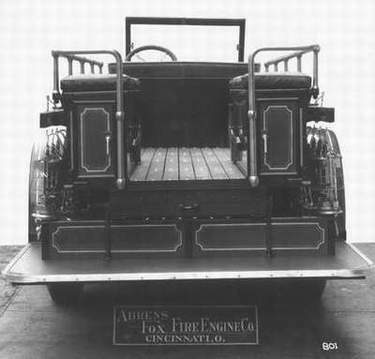 A rear view of the 1930 Ahrens-Fox showing the bench seats for the crew. 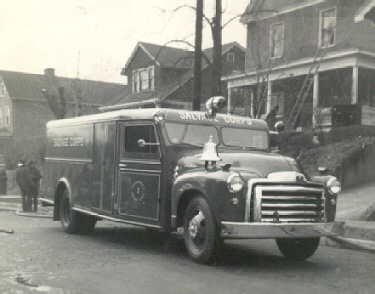 Notice the trio of Dietz Fire King lanterns along with the folding ladder on the side of the apparatus body. 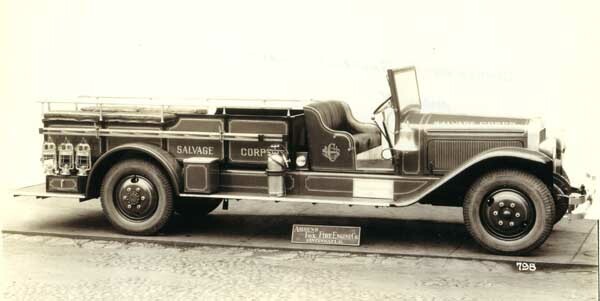 1922 White salvage car. The body for this apparatus may have been transferred from an older unit. Notice the stack of covers behind the seat. The streets and building of Cincinnati have changed a great deal in almost 100 years. This photo from 1908 shows the newly completed Harrison Avenue viaduct. The east end of the viaduct was at Barnard Street. 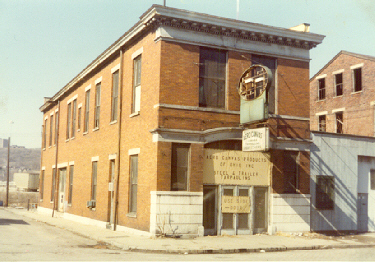 Station #2 of the Underwriters Salvage Corps was a block south of Harrison Avenue at Barnard and Lowry Streets (the arrow points to the building). 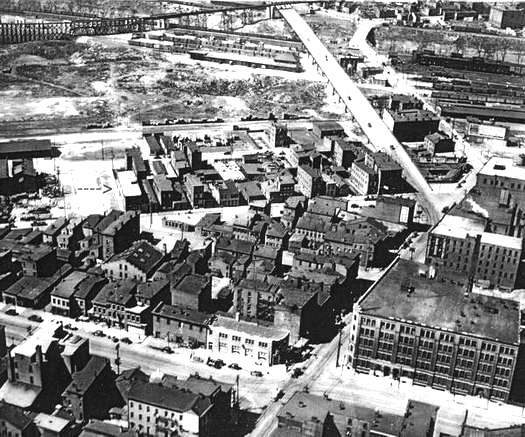 A few of the larger structures at Harrison and Spring Grove Avenues (bottom, center) are still standing. This can give you some perspective of the former location of this station. 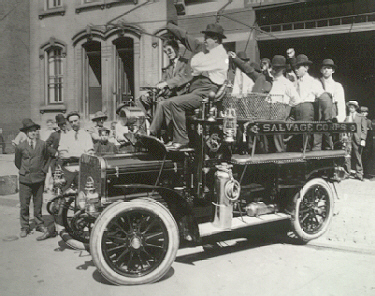 This 50 horsepower Winton automobile was purchased by the Underwriters Salvage Corps in 1905 from the Hanauer Automobile Company on East 7th street. 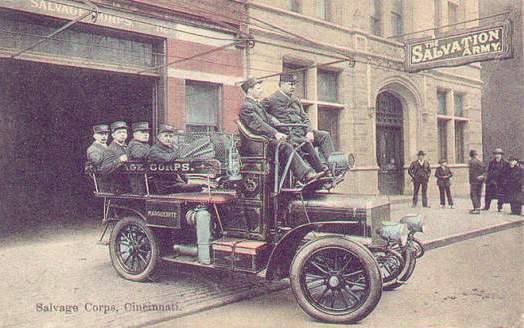 Hanauer added the custom body and delivered the first piece of motorized fire apparatus to see service in Cincinnati for the sum of $3,500. Notice that when the photo was taken the corpsmen did not have uniforms. Another view of the 1905 Winton/Hanauer. The driver and Chief Conway of the Corps are seated well above the crew. In this view of the 1905 Winton/Hanauer, the driver isn't wearing a uniform. Could it be that when this car was delivered none of the crew knew how to drive? 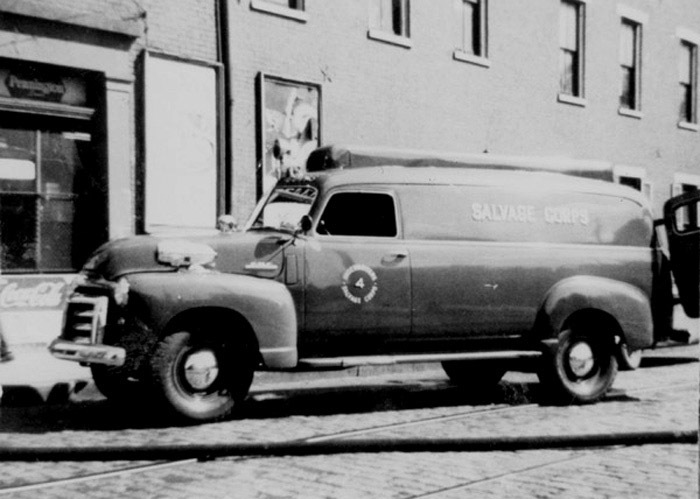 Salvage Corps Station 1 at 918 Elm Street. 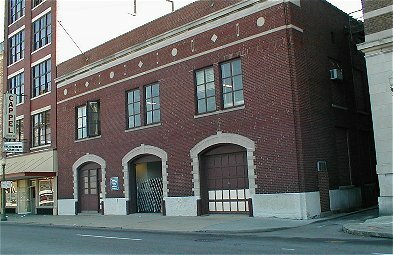 When this station was opened in 1924, Station 1 on East 8th Street and Station 2 on Bernard Street were both closed and the companies moved to this location. Station 2 of the Underwriters Salvage Corps at Bernard & Lowry Streets. 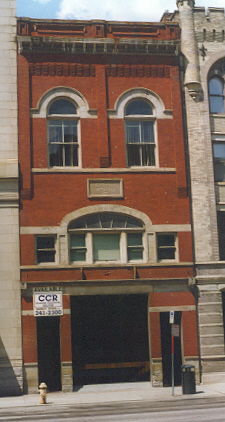 Constructed in 1906, this building was demolished around 1982. The side door at the rear of the building was the mechanical shop for the Corps who had purchased thheir first motorized rig the year before this station opened. 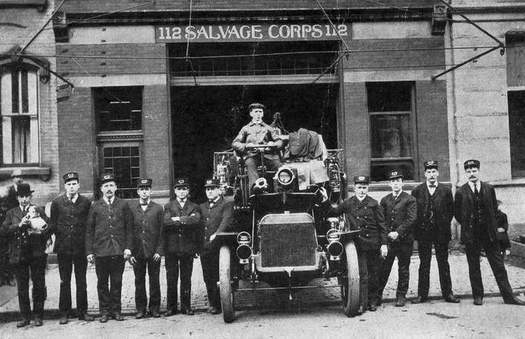 Station 1 of the Underwriters Salvage Corps at 112 E. 8th Street. 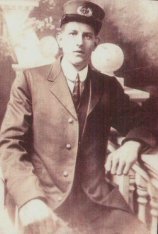 Edward John Duncan of the Underwriters Salvage Corps. Mr Duncan served from around 1937 until 1959. 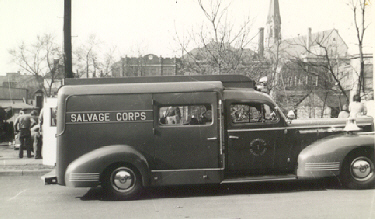 The Salvage Corps uniform was identical to the CFD, right down to the crest on their hats.